You can add an individual Reviewee back into a review cycle once the review cycle has closed. Remember, you can close an individual's review cycle or you can close the review cycle as a whole. Either way, you will be able to add a Reviewee back into the cycle, if needed. 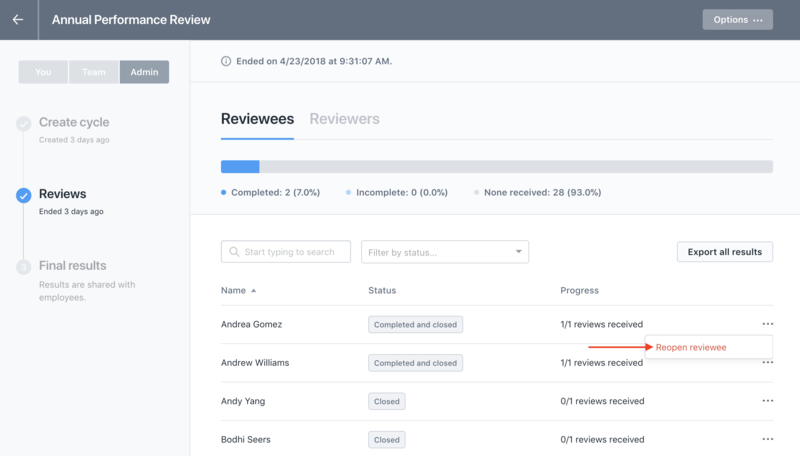 Step 5: Click on the ellipsis next to their name and choose "Reopen Reviewee"
Please note that reopening a reviewee will only allow people who have not submitted their reviews to work on their reviews again. If the review was already submitted for the employee, please follow these steps to allow the reviewer to edit their already submitted responses.